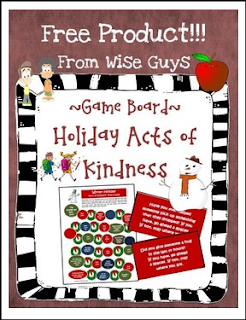 This is a game with a "Acts of Kindness" and winter theme. All you need as a teacher is to print the game board (card stock seems to work best), cut up the game cards, supply a die and some tokens for each team, and then watch the fun! Have you ever donated food to the needy? If you have, go ahead 5 spaces. If not, stay where you are. or...Did you give someone a hug in the last 24 hours? If you have, go ahead 3 spaces. If not, stay where you are. This is a fun activity that could maybe be used as a station during a holiday party or other classroom activity. Click HERE for our Christmas Bundle!